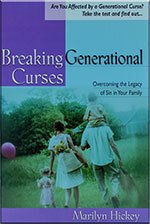 Marilyn Hickey: "Breaking Off Generational Curses in Your Family Line!" One of the most important voices today is that of Marilyn Hickey. Marilyn is not only an amazing expert on the Word of God but also the Holy Spirit too. You’re really going to gain an advantage in breaking off generational curses from your family line by watching this episode. I was SO impressed with Marilyn Hickey when I interviewed her that I want you to learn what she has to teach you. You can watch it RIGHT NOW! After watching Marilyn Hickey's episode, I encourage you to go further and grab hold of this exciting and new package we've put together just for you, our Elijah Streams viewer. To view and order those products click here. Enjoy this episode and special products from the Marilyn Hickey! There is a battle for your family! Your enemy knows your weaknesses. If you don't—you must call NOW to order Marilyn Hickey's BOOK and exclusive Five-CD set entitled: "How to Break Off Generational Curses in Your Family Line!" Take your first step NOW with international author Marilyn Hickey—as she guides YOU through identifying and breaking the Generational Curses in YOUR life! In this easy-to-understand book and audio collection, you'll discover the "root causes" for unhappiness and dysfunction in your home. Marilyn Hickey will demonstrate, through God's Word, that many problems are most likely rooted in a "family curse" that has been passed down from generation to generation. When you follow the simple, practical steps in this freedom package, the Lord will cleanse you from generational curses—to experience His blessing, protection and the miraculous in your life! You'll enjoy an arsenal of rock-solid foundational tools—to purge your family-line of those things that block you from receiving God's blessings. This package is all yours for a donation of just $49 dollars. Shipping and handling are included.